FreshMarine.com - Red Footed Tortoises (Adult) - Geochelone carbonaria - Buy Red Footed Tortoises Now and Save! Red Footed Tortoise is a medium sizes tortoise which is found in the ranges from savannah to forest-edges around the Amazon Basin. On an average, they 12 inches in length but they can also extend up to 16 inches and they can weigh up to 30 pounds. Their scientific name is Geochelone Carbonaria and proves to be a great pet because taking care of them is easy. Carapace is dark colored which comprise of a lighter patch in the middle of each scute. Their carapace is an elongated oval, highly doomed and smooth. The males have large concave plastron though the color varies and is thick along the edges. The head is small and flat from the top. Upper jaw is slightly hooked. Males are more colorful than females. The tales of both the genders are also different. Males have longer and muscular tail whereas females possess a shorter and conical tail. This species is very active and vigorous. Most of their activities take place in rainy season and mating occurs in this time period. While mating, males make head moments which means approval. Males also sniff at the tales of females before mating and throughout the period of mating and courtship, males are also found making chuckling sounds. July, August and September are those months when females lay clutches of 5 to 15 eggs which are buries in a nest in the ground. Hatchings look completely different from the adults as they are round and flat. They grow mature slowly and attain sexual maturity quite late. Geochelone Carbonaria can live up to 50 years but they are prone to respiratory infections. The natural habitat of Red Footed Tortoise has high levels of humidity and temperature varies from 20 to 35 degree calcium. These tortoises tend to die when exposed to extreme cold and wet environment so while preparing an artificial habitat, maintain the temperature between 85 and 90 degree Fahrenheit. The level of humidity should be kept above 75% so mist the cage daily with water. The terrarium should be big enough to allow them to move around. A UVB light for 12 to 14 hours a day is also essential. 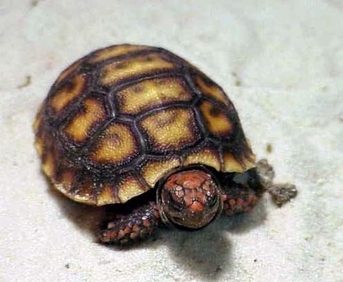 It produces Vitamin D3 which helps the tortoise in metabolizing proper amount of calcium. In its absence, the bones of the creature weaken and they tend to die due to metabolic bone diseases. Change the UVB light after every 8 months. Provide a shallow pool to allow them to soak in water and place a bark inside the terrarium as it will not only offer a hiding place but hold moisture too. They are fed a great variety of fruits like mangoes, melons, grapes and dark leafy greens like collard greens, mustard greens, dandelion greens, hibiscus leaves etc. They also enjoy other vegetables like mushrooms, green onions and flowers too. Calcium and vitamin supplements should be sprinkled on their food every once in a while. Feed your tortoise from a grass surface, flat rock or from a tray only.